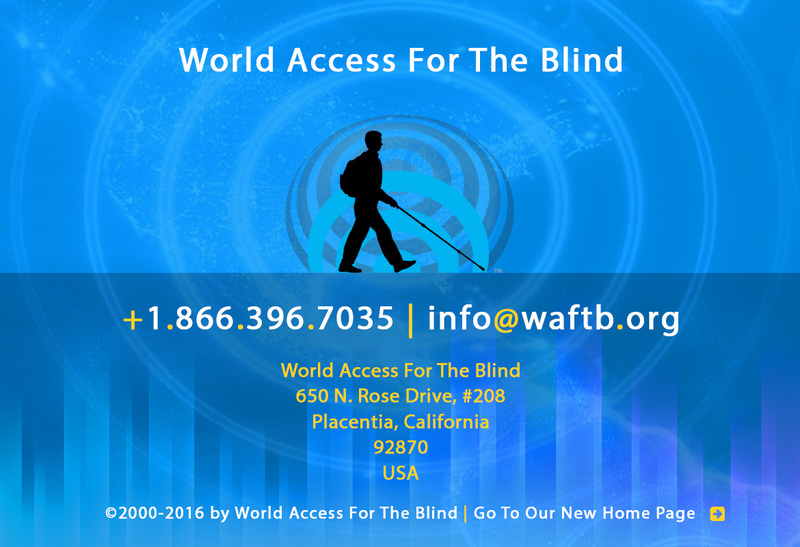 World Access for the Blind is a 501(c)(3) Non-Profit organization that facilitates the self-directed achievement of people with all forms of blindness, and increases public awareness about the strengths and capabilities of blind people. We have served over 10,000 students in nearly 40 countries. We are a dedicated team who lead by example , as most of us are blind! Our unique, scientific method teaches blind people to see in new ways by activating the brain to gain images of the world through sound and touch - like lighting a match in the dark. We are known for our No Limits attitude, as we do not settle for the minimum requirements of functioning, but instead challenge ourselves and our students to reach beyond their limits. Our students understand that they can direct their own lives rich with quality, promise, and as much excitement and intrigue as they could wish for. 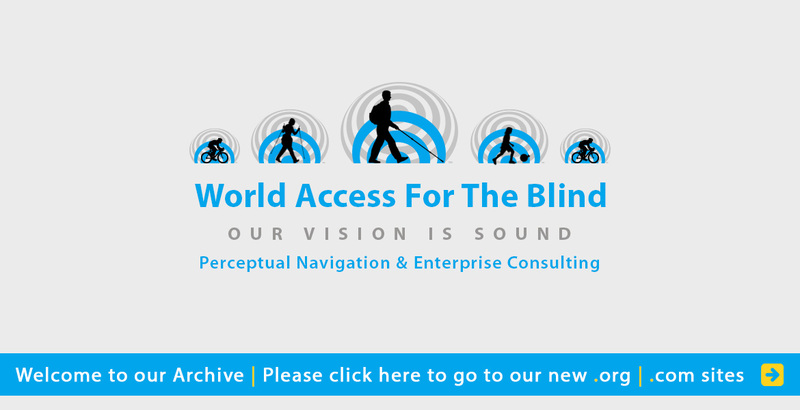 By our approach, blind people can grow from being passive recipients, often marginalized and restricted, to active contributors free to achieve a quality of life of their own choosing. Through your generous support, we help more blind children and adults globally to improve their quality of life, to challenge poverty and social isolation, and to find freedom to realize their dreams. Daniel Kish Delivers a warmly stirring and personal perspective on his own life, blindness, and helping others to navigate their challenges. "How Daniel Kish, who’s been sightless since he was 13 months old, taught himself to see through the blindness—to find vision in the echoes" Daniel's well received TED talk led to his interview with Success Magazine. This captivating article features Brian Bushway and Daniel illustrating the process of seeing with sound. It investigates how blind people learning to see are helping everyone learn to see more clearly to navigate life's unknowns with less fear and greater purpose. The article quotes generously from Daniel's TED talk. Daniel Kish is among a handful of modern explorers showcased to comemborate 125 years of National Geographic. Includes videos. "How the human brain adapts to blindness and allows us to see our world through echolocation." Brian is put to the challenge of using his FlashSonar to describe a random sculpture for a forensic artist to draw, unseen. If video linked above is restricted, try this. Touchingly thought provoking coverage of one of our Perceptual navigation instructors, Brian Bushway, and Daniel Kish conducting a family workshop with Juan Ruiz in Nuernberg, Germany. Includes some balanced controversy. J Louchart, one of our Perceptual Navigation Coaches, demonstrates FlashSonar under strong wind and heavy snow conditions. 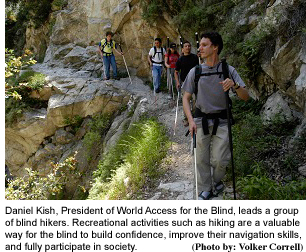 About Daniel Kish and his work through World Access for the Blind to help blind people to find sound vision. Voted 6th best read of 2011 by Reader's Digest. By invitation of Guinness Italy, Juan, who is totally blind, sets the world record for blind bicycling through a random obstacle course using only FlashSonar. He gave a stirring speech that made the audience cry. "John Pak helps us understand how to navigate a sighted world without sight." Gives a perspective on Daniel Kish's training his "super hero power" when he was an 11 year old boy. 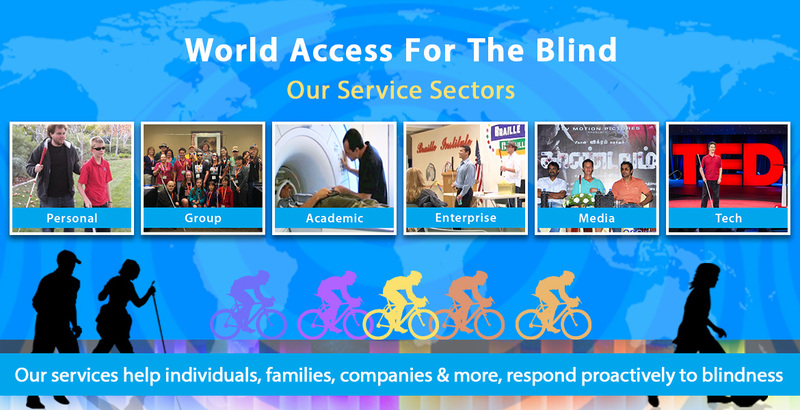 "World Access for the Blind uses unconventional methods to help people walk, bike, hike, and play without relying on anyone else."